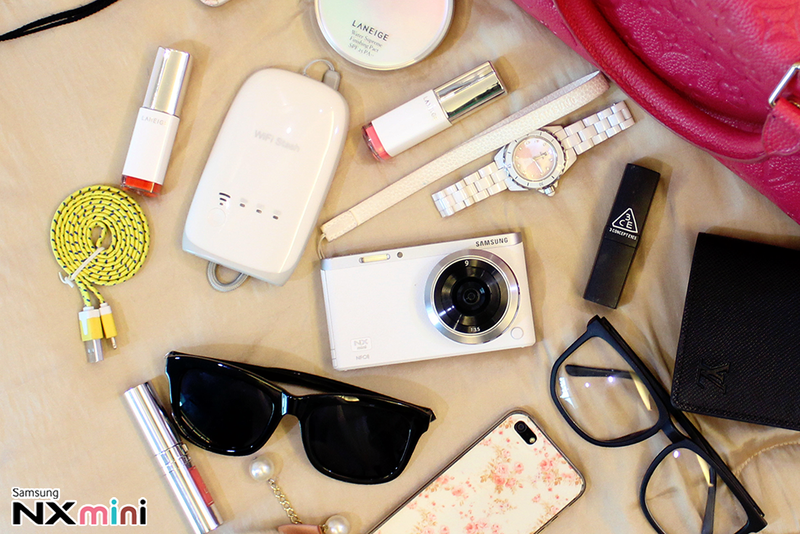 What's in my bag daily? Anyway, my personal preference was jotted down my momento by using camera but not phone's camera although they claim how freaking good mega pixels they own. Don't get me wrong! Phone's camera is good but not the best because I always found camera creates the best quality outcome of pictures. I bet many of you understanding what the meaning I'm saying. So how's good is Samsung NX Mini can perform? Here's my personal thought of this camera! The surface texture of this camera is sophisticated leatherette design and it's never get stain easily by any dirts in my personal experience. Overall this camera is stylish and I absolute fall in love with the design; sleek and thin enough yet with high outcome performance with a huge selection of colors specially for own preferences. My favorite color would be coffee because it's so classic and kinda vintage for me but not available yet since when last time when I get opportunity to try this camera, so white is perfect for me. Question: Did your white Samsung NX Mini starts to turn yellowish? My answer is NO but my strap is, hahahaa. I think is time to change to a more funky style of strap. This camera has been following me daily (really!) everywhere in my bag for more than three months. If you're know me in person, you know how messy was my bag! Even sometime I'm hard to find something in my bag. So far, the color is still marshmallow white and no dirt stains on the surface. The dirt is easy to wipe off by just using wet tissue. It's still look brand new until now. Question: How is the color performance? If you like something bright and vibrant then this camera might bangs your heart. The color performance is more to yellow tone which makes overall picture is more vibrant in contrast and colorful. It can easily capture a catchy picture but it's not really good when shooting night scene. It's need helps from 'aperture' function and also from flash (preferable fill-in flash) to capture a sharp and attractive picture. If your requirement are not professional picky like me, then basically this has nothing effect for you because Samsung NX Mini smart enough to helping you to adjust the environment. Question: How about the lens? I have tried both lens. I am absolute hands up for external lens (NX-M 9-27mm F.35-5.6 ED OIS Lens) for the reason is zoomable and setting adjustable. In simple way, basic lens is like a pancake lens or so call portrait lens while external lens is zoom with wide angle lens. If you're keen with Samsung NX Mini and have no budget for both lens, I recommend to top up some money changing basic lens to external lens which will made your life even happier, lol. Here's the easy and simple table comparison between basic lens and external lens I did to those who are curious and confusing; also specialist for noobie who not understand well functionatic of a camera. 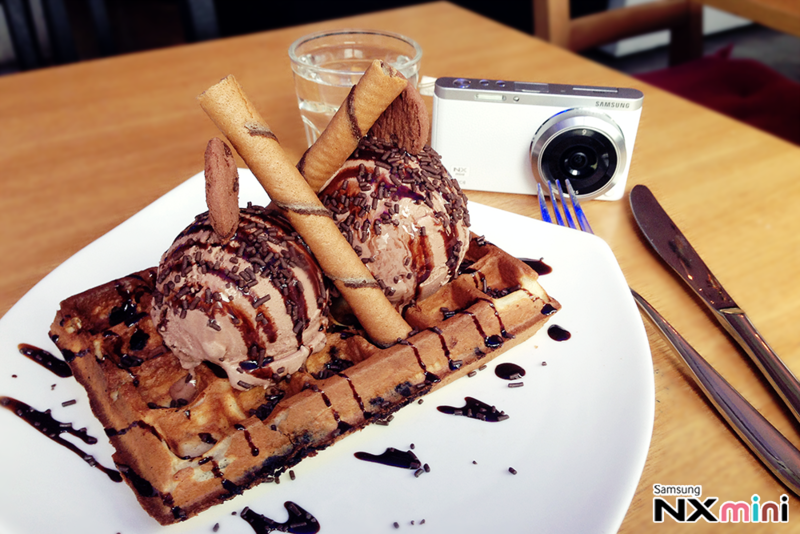 Samsung NX Mini is my bestie when comes to capturing the deli of food. Question: How light is Samsung Camera and izzit hard to play to control? Samsung NX Mini only ultra slim with 22.5mm & light which is only 158g where I could say is a size of normal compact camera but will big performance. You will never feel heavy and burden when bringing it out anywhere. That's why this camera becomes my go go camera. For controlling wise, I am super understand the feeling when a camera comes with 'pro'-setting. It's really kinda annoying when comes to complicated adjustment especially for those who are newbie or people who lazy to explore (one big dummy DLSR already made us headache). Samsung NX Mini is really easy to play with. I love the smart system by clicking the effect mode I want and then only need to adjust brightness and contrast, that's all. The setting system is really easy to understand. Question: Izzit good when capturing night scene or action ? You can refer the quality and outcome of pictures when I took at Sam Tsui & Kurt Hugo Live Performance by using Samsung NX Mini with basic lens (NX-M 9mm F3.5 ED Lens). For action part, I give this camera 4.5/5 because when I captured Sam Tsui on stage, he tended to be so super active moving around the stage during the performance. No joke! I tried so hard to follow his movement. Samsung NX Mini did quite a great job because 95% pictures I found is all clear. The only regret was I brought the wrong lens; should brought external lens (NX-M 9-27mm F.35-5.6 ED OIS) so I can zoom for close-up shot. For night scene, I still kinda confusing right now. All I could say is depending on the light surrounding the environment. For the performance, the color outcome is awesome. Vibrant, clear and catchy. I gives a big thumb up! By the way, I am using 'Auto Mode' for the performance. 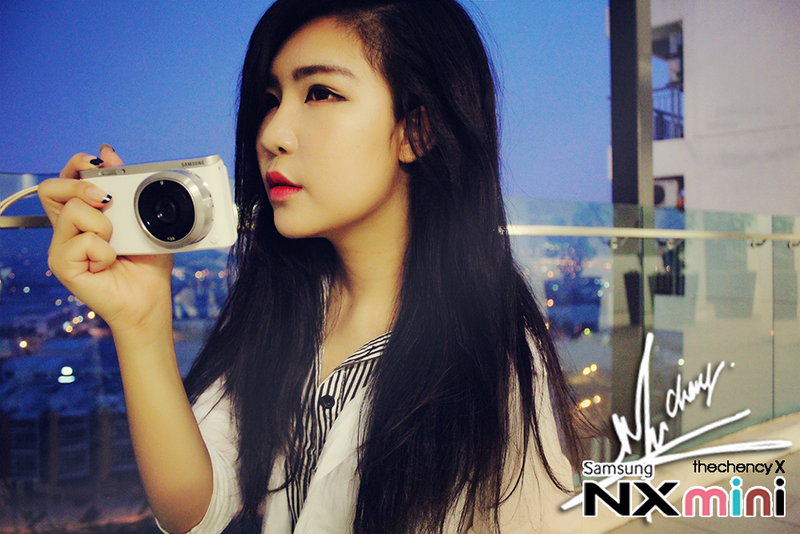 Question: What is your dislike on Samsung NX Mini? 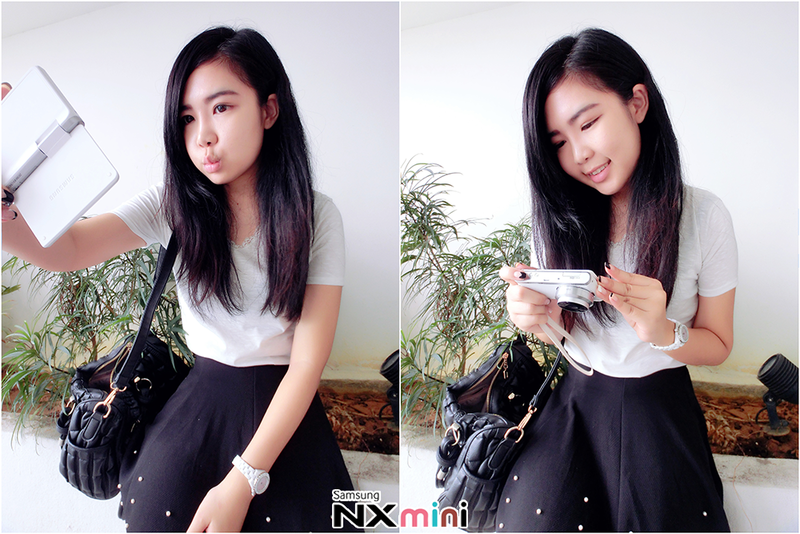 Samsung NX Mini is a worthy camera to invest because it is small like compact but own a pro-system body. Another kill shot for you is Samsung NX Mini comes with five color variants suiting your personal preference. For overall performance, Samsung Camera is smart. It helps to auto adjust your picture so for those who want a nice picture with less work, here's you go! I recommend top up your budget changing to external lens instead of basic lens because external lens is adjustable and zoomable especially in a dim environment. Not only that, it comes with 180° mirrorless flip-up design with many selfie mode like wink shot or smile shot to makes our life easier when selfie. It also has share-on-the-go function by uploading straight to social media or transferring to phone, all you gonna do is go download Samsung App. I love the selfie part! The best camera review I ever read, seriously. Most people just took photo without further elaboration. And you honestly mentioned the pros and cons as well.